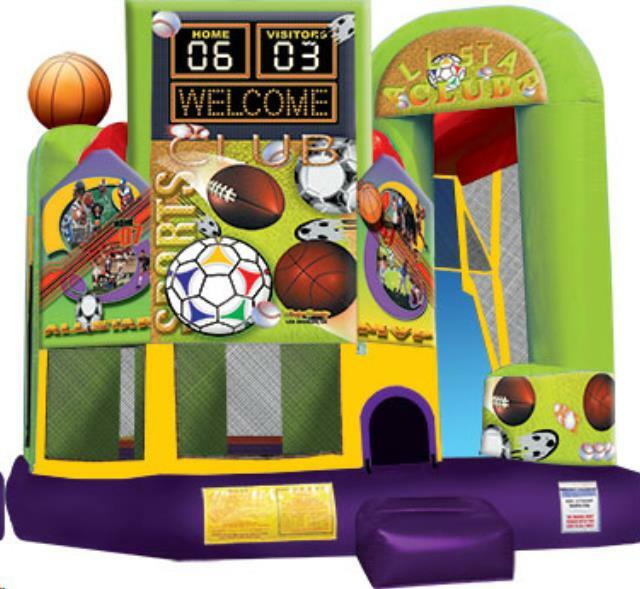 The Sports Club Combo bounce house offers it all: a football, basketball, soccer, and baseball theme to score points with any novice player or sports fan. Ideal for sporting events, family reunions, sport camps or after the big game, this bounce house will keep players entertained for hours on end. The bounce house features a three-dimensional basketball atop one tower, a fun home-advantage scoreboard and an "All Star Club" banner over the slide. The spacious interior jumping area offers a basketball hoop, an exciting climb feature and a convenient exit slide for hours of active fun! Parents and spectators are offered easy viewing with the 360-degree mesh sides. The Sports Club Combo is made of lite n strong fire-resistant vinyl making a safe, durable and perfectly portable product. This awesome Sports Club Combo is sure to make any indoor or outdoor event a great success! **includes (4) stakes and (1) blower and (1) strap. * Please call us for any questions on our sports club slide bounce combo rentals in Rocky Mount and Wilson NC.